Joy and happiness are two similar emotions that may often occur together. They are both pleasant emotions that are connected with enjoyable thoughts, events or activities. Sometimes the terms are used interchangeably. However, there is a distinction between these two types of emotion. Happiness tends to be used as a broader, more general term than joy, and people can be happy in many different ways. A happy person may be joyful, for example, but they could also be happy in a much quieter way. Happiness can take many different forms and it can arise from many causes. It can result from something immediate and short-term, or from a longer term cause or a pleasant memory or wish for the future. It can be caused simply by an enjoyable sensation, but it can also stem from a meaningful achievement or from engagement in social relationships with friends and relatives or in fun activities. Happiness can involve feelings of satisfaction after the completion of a project, feelings of contentment about one's life, excitement and anticipation for an expected event in the future, pleasure in the present moment, or a joyful celebration. Defining happiness can be difficult, but research has shown that people who consider themselves to be happy usually share certain characteristics, such as enjoying good relationships with friends and family, having a long-term partner or spouse, engaging in social activities, being employed, being healthy and physically active, and having an optimistic outlook. However, it is impossible to say whether these characteristics are the cause or the effect of happiness. The feeling of happiness is generated by the release of hormones known as endorphins in the brain. Many different things can cause endorphins to be released, from kissing a loved one to eating chocolate. Happiness can even be created in the lab by stimulating the brain in a particular way. Joy is a particular form of happiness that is characterized by feelings of delight or gaiety. It is often stimulated by good fortune or a celebration, often of something that has huge personal significance and which will continue to be a long-lasting source of happiness. Joy is also used with some religious connotation as the attainment of a state of bliss. The meaning of the word joy is hidden in the origin of the word, which derives from the Latin word gaudia, which means to rejoice. Since happiness can take many different forms, it can be expressed in many different ways. Happiness may be expressed through smiling, laughter or other immediate responses, but it can also be a state of mind that may not be apparent to other people. A person who feels happy will not necessarily feel the need to walk around with a smile on their face all day. Joy is a type of happiness that often does tend to be associated with an outward expression or celebration of happiness. It is a boisterous and often noisy form of happiness that results from some cause of elation in the present moment. Someone who is joyful or rejoicing will often be showing outwards signs of happiness such as smiling and laughter, or participating in some form of celebration. Celebrations such as birthdays, festivals and religious holidays are often described as joyful events. It is also common for good wishes to be given in the form of wishing someone joy. Joy is a form of happiness that is typically linked with celebration and an outward display of emotion. However, joy, in the religious sense, can be a longer term feeling that is associated with the attainment of enlightenment or certainty in one's faith, rather than simply the excitement and pleasure involved in a particular happy event. Happiness is a pleasant emotion that can range through many different levels of intensity and forms of expression. Happiness is a general term used for a range of different pleasant emotions. Happiness can take many forms from quiet satisfaction to hysterical laughter. Joy is one type of happiness that is one of the most intense and outwardly expressive forms. Although joy is often associated with an intense enjoyment of the present moment, it does not have to be a fleeting emotion. Attaining long-lasting joy can be an important spiritual or religious goal. Joy is a form of happiness characterized by outward rejoicing. 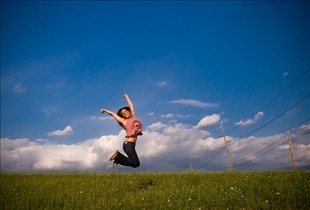 Success vs. Happiness: What's the difference? Aquarius vs. Leo: What are the differences?